Cargo Carrier - Hitch Truck & Car Racks from Proline: Thule Racks, Yakima Ski Racks, Bike Racks Canoe and Kayak Racks Cargo Carriers and Truck accessories. Stowaway 2 Flat Swing away hitch receiver mounted cargo carrier. 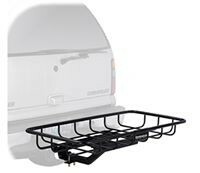 SporRack Vista SR9851 Hitch receiver mounted cargo carrier basket. Thule 665C Transporter Cargo Carrier Boxes. FITS 1.25" AND 2" HITCHES 13 cubic foot cargo box. Includes lights and is fully locking. Pro-Series Cargo Carrier Basket 1040300 receiver mounted cargo carrier. Stowaway 2 Sport Plus model fixed frame hitch mounted cargo carrier box. Includes lock and wired taillights with 12.8 cu ft of capacity. Stowaway 2 SA024.0 MAX standard hitch mounted cargo carrier box. Fixed Frame with 7 inch rise.